What is a hackathon? There are conferences and companies and organizations all getting into the action these days. There are now hundreds of hackathons that are happening all over the globe. Just going by Hacker League’s numbers, in the first three quarters of 2013 they have registered more than 200 hackathons. That is a lot of hacking, but what exactly is going on at these events? Simply put, a hackathon is a gathering of people coming together to build stuff in a short amount of time. Mostly this has been in the context of software and developers. However, over time hackathons have expanded to include many different disciplines and talents beyond technology, often in collaboration utilizing a diversity of skills to build some creative and fascinating products. While the occasional breakout hit emerges, the hackathon is more about trying stuff out rather than building something enduring. The first recognized hackathon events started back in 1999. One event was a communal group of developers hacking away at OpenBSD to build crypto solutions, while another was a hacker challenge hosted by Sun at the JavaOne conference. Hackathons gained greater awareness with Mark Zuckerberg hosting internal hackathons at Facebook, Yahoo hosting a Hack Day on their APIs, the global BarCamp and Startup Weekend events and conferences like TechCrunch Disrupt. As Jon Gottfried explains in his presentation on The History and Evolution of Hackathon, from these simple beginnings have evolved hackathons of all shapes and purposes from competitions to fun gatherings to community building to straight up marketing. So why bring this up? 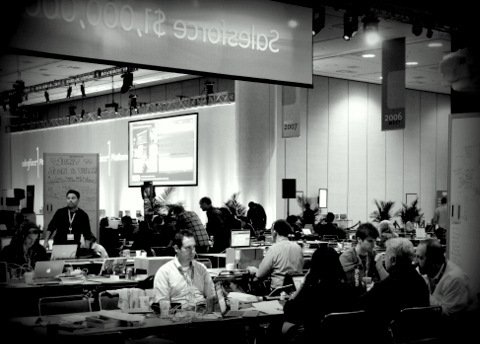 I attended the Dreamforce 2013 Hackathon by Salesforce.com recently, the first hackathon I have attended in a few years. My friend and I went with few expectations given our lack of tech chops but figured we would try our hand at a $1 million pot while using the event to hack on some Salesforce integration ideas for a product. There were other reasons for heading out to San Francisco though, so the hackathon just happened to fall at a convenient time. As you might have figured from the news, we sadly did not win (check out our YouTube video to view our submission). The $1 million winner happened to be two gentlemen who submitted a brilliant analytics app called Upshot. The idea was so brilliant and well executed that it was in fact demoed at a Meetup over a month prior to the hackathon. Given the rules, however, about the use of existing product, it appeared that Upshot ran afoul of the spirit of the hackathon. Plenty of people have cried foul over this and many other apparent issues, including submissions that were not even viewed. What could have been a huge marketing coop for Salesforce.com and a bump in its credibility in the developer community was now turning into a major controversy. I have been a critic of Salesforce.com’s software and strategy for some time. While they deserve major credit for helping lead the evolution of enterprise software in the cloud and championing SaaS, the software itself was nothing more than Siebel but in the cloud. In the process, they missed numerous opportunities to lead in analytics, to make a foray into mobile, to remake the user experience, to ease the way systems and data flow across the enterprise. They missed every opening and in many ways confirmed the worst about the enterprise technology industry. The two biggest SaaS enterprise business software providers, Workday and Salesforce, are merely riding the cloud wave started more than a decade ago and have added little else since. Despite all this, I really wanted the Salesforce Hackathon to turn out well. Of any company in the enterprise tech space, they had the most to offer and best platform upon which to deliver truly innovative and groundbreaking solutions. Companies do not need any more databases. They need better ways of better using the data they have. They need better solutions that allow their employees to work smarter. They need better software that does the analytical heavy lifting without incurring enormous costs. Consider the breadth of technologies that are in the Saleforce universe today with Force.com, Heroku, ExactTarget, AppExchange, Visualforce and a fairly extensive API across their products. Besides that, they have the biggest ecosystem in the SaaS world, with the most customers and the most partners. I had my doubts early on about the success of the hackathon. They initially charged participants $99 to enter before making the event free. They had stated that no prior products were allowed, though that was clearly not the case. When we asked Salesforce about the use of our own product, they said that it would be allowed. As we got to the event and put our hacker hats on however, we just trucked along. While we were certainly disappointed that we did not win, what we put together will become the basis for future product, so from that perspective the time was well spent. For almost everyone else however, Salesforce did a poor job in the transparency department. You could not view all submissions after midnight, the judging process was a blackbox, those who did not win got zero feedback on their submissions and the conflicts were not addressed nearly fast enough or with any level of sincerity. It was a corporate whitewash, the smell of which is so rotten it appears on the Wikipedia page under the topic “Hackathon.” The $1 million prize was a good marketing ploy given the level of distrust the developer community has for corporate-led hackathons. But it was a double-edged sword because now it has sullied future attempts at hosting hackathons with any shred of credibility. Which brings us full circle to the topic of hackathons. While I had hopes of something different, in the end it was a corporate hackathon, one expressly for the purposes of Salesforce to highlight their products. There is nothing inherently wrong with that, but one needs to know going in that the fix could be in. Transparency and openness are not the default modes for billion dollar corporations where rules are bent and pressure applied as necessary. It seems many people who participated expected a different outcome, but I saw the writing on the wall going in given the red flags prior to the event. Lower the prize money – You know what’s cooler than $1 million? Giving away a smaller prize and not getting egg on one’s face. Salesforce pushed the envelope, but they also upped the risk and the attention. It also made the hackathon only about the money. Prizes are not the reason you get the best hackers. You get the best hackers when you have interesting problems to solve and an event that values creativity. You can have a prize, but make it more reasonable so that it does not hog the attention. Transparency in judging – No one had a sense of who or how the judging was taking place. It was all Salesforce folks, but it would have been better to have a more diverse mix of judges. Also, without any feedback on the other submissions, it was hard to get a sense of what other solutions might have been in the running. The entire process was simply a blackbox. Clearer criteria – Existing code, not existing product, was a clause ripe for abuse and creative interpretations. While in theory, one could argue that Upshot was clear because the focus was on the web portion of their product, it really comes off as a dodge. But they were not the only ones using existing product, so you had teams who came with the advantage of a ready-made product and those who decided against it. Involve the crowd – This would have been an interesting way to involve the attendees to place their picks as to the best hacks. Having a “crowd favorite” would have enhanced the openness of the event and made it more inclusive. It also makes it less about the corporate agenda and more about actual innovation and creativity. Share the load – Salesforce made the hackathon all about them. That is fine because they wanted to highlight the push for the Salesforce 1 Platform, but it also increases the risks, administration, responsibility and cost. It also limited the range of solutions. They could have gotten any number of partners to contribute and help out, thus unleashing more creative hacks than the ones we were presented with. Do not charge hackers – Really, what were they thinking? If you are a billion dollar corporation with tons of sponsors and tens of thousands of paying conference attendees and you are charging to attend your hackathon, that is just insulting. At least Salesforce got wise quick, but hopefully the idea of charging hackers dies a permanent death. These are folks already committing their time and talents, and charging them just speaks volume to the level of respect you are showing them. This may sound like a long rant on Salesforce, but it is not. They clearly could have done a better job, and I suspect that what transpired was an eye-opener. I believe their next event will be much better organized and transparent. At least I hope so because we need more of these enterprise tech-focused hackathons to help unleash a new wave of creativity into the corporate sector. What we have now are stunted attempts at innovation that merely ape existing ideas or offer only modest iterations. We can change that mindset, but only if corporations stop trying to pass off hackathons as sham marketing and recruiting events. This article was originally published on Strong Opinions, a blog by Birch Ventures for the NYC tech startup community.